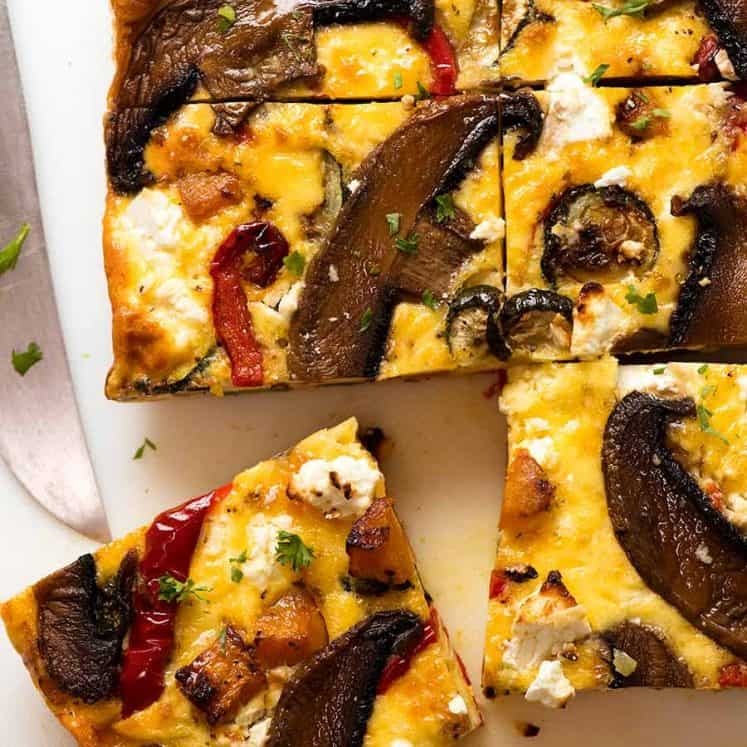 Wake up to an irresistible weekend breakfast that’s super quick! 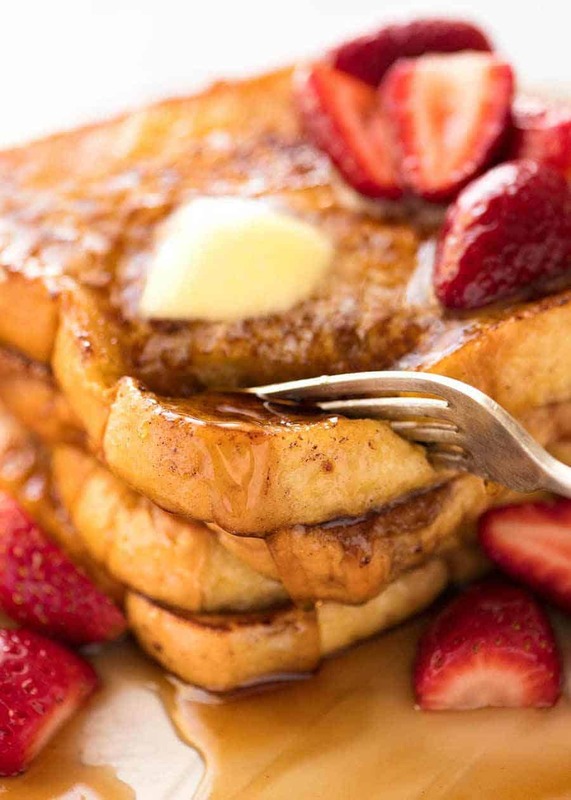 This is how to make French Toast – whisk 2 eggs, 1/2 cup milk, cinnamon and vanilla. Dip bread, pan fry in butter for 2 minutes each side until golden, then douse with maple syrup! French toast will always be a staple for leisurely weekend breakfasts along with my favourite fluffy Pancakes and Pancakes bursting with Blueberries. So skip the bistro queue and make brunch at home this weekend! You know when you feel like making something grand-ish for a weekend breakfast and but you’re too bleary to tackle Eggs Benedict? 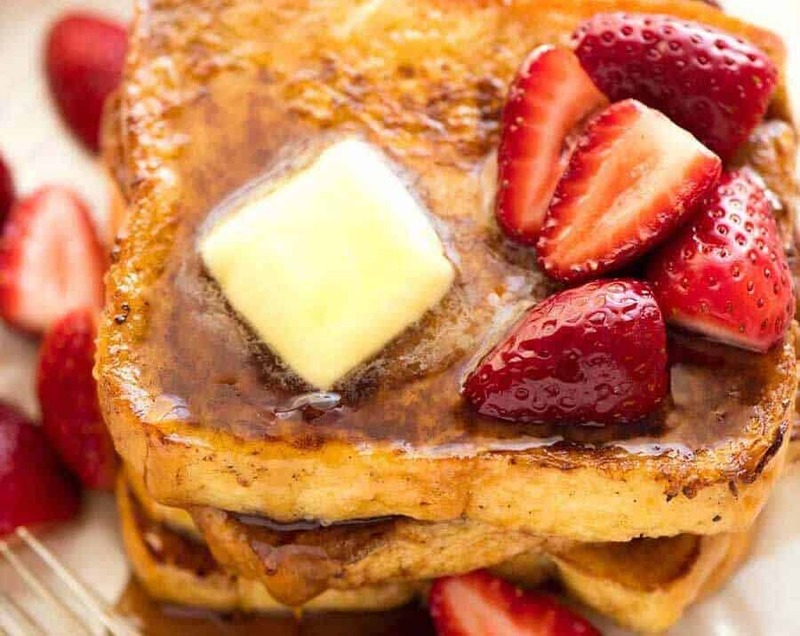 French toast is your answer. Always. Why? Because it’s effortless, and there’s a plethora of topping options! Whisk 2 eggs with 1/2 cup of milk, 1/2 tsp cinnamon and 1 tsp vanilla. Dunk bread of choice (stale is best), then pan fry in butter until blushing gold on the surface and crispy golden on the edges, then douse liberally with maple syrup. What does French Toast taste like? It’s sort of like Bread and Butter pudding. Custardy on the inside with buttery crispy golden edges, it’s even great to eat plain but, like pancakes, ideal for smothering in maple syrup! Buttery brioche is my bread of choice – pictured in the photos. It’s a total shameless indulgence, a copycat of trendy local bistros that charge a small fortune. Crusty artisan breads (sourdough etc). I personally don’t favour the sourdough flavour in my French toast, but I know some people love it! From everybody’s favourite maple syrup, to fresh fruit, caramelised fruit, compotes or fruit syrups, ice cream (for breakfast! ), chocolate and caramel sauces, nuts, BACON (yes, yes, YES!!!)….. My favourite is plain French Toast with just maple syrup and a little pat of butter. The only reason I added strawberries is to make the photos look a teeny bit prettier. 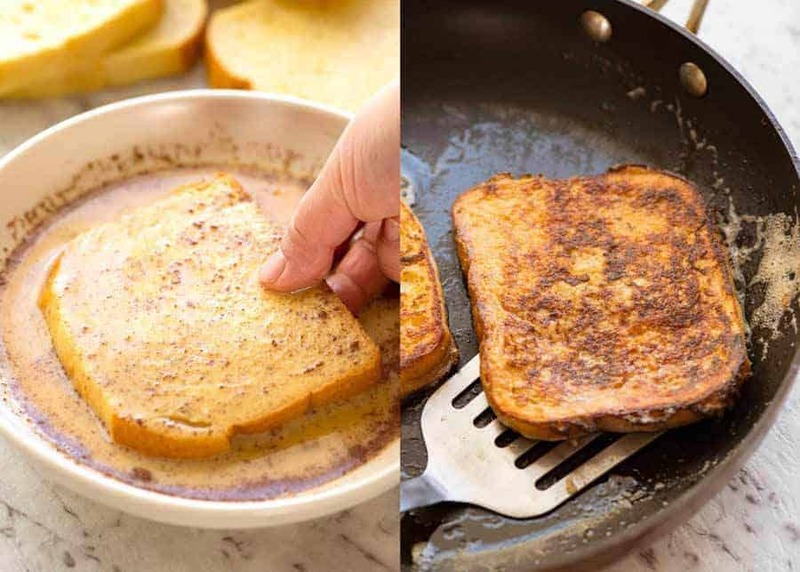 Because, as readers know, I’m very conscious that my blog is so dominated by so much yellow and brown foods, and this French Toast recipe falls firmly into that bucket. Recipe video above. A recipe everyone should know! Made for using up leftover bread, but if you want the ultimate French Toast experience, use brioche bread (pictured in post). 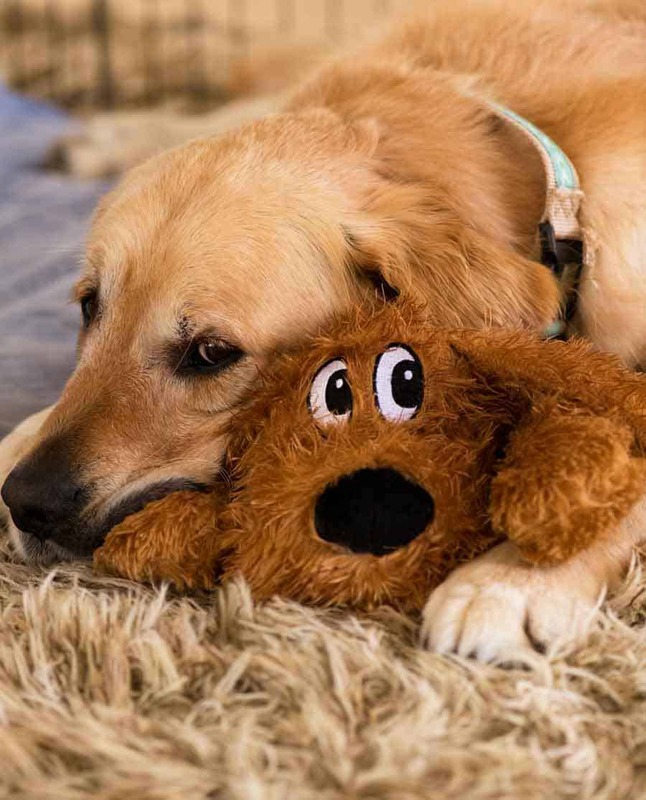 There’s no need to use sugar if you’re dousing with maple syrup – plus it burns easily. Best made with stale bread, otherwise, see Note 1. Whisk together Egg Mixture in a bowl. Vigorous whisk = avoid cinnamon floating on top. Melt 15g / 1 tbsp butter in a non stick skillet over medium heat. 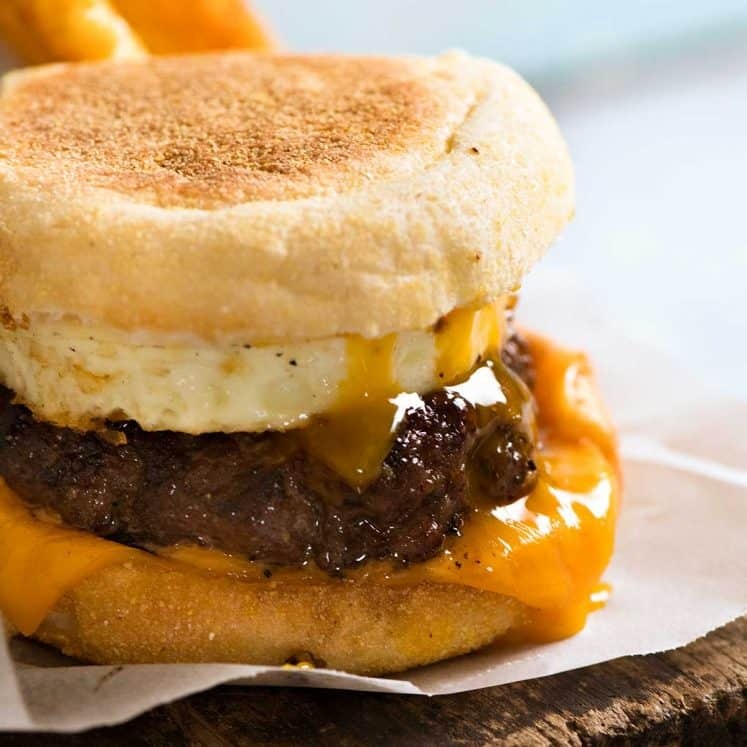 Dunk a piece of bread quickly into the egg mixture, coating both sides. Place in pan. Repeat with more slices to fill the pan, but don’t crowd it (do 2 or 3 at a time). Cook for 2 ½ - 3 minutes on each side until the surface is golden, then transfer to serving plates. 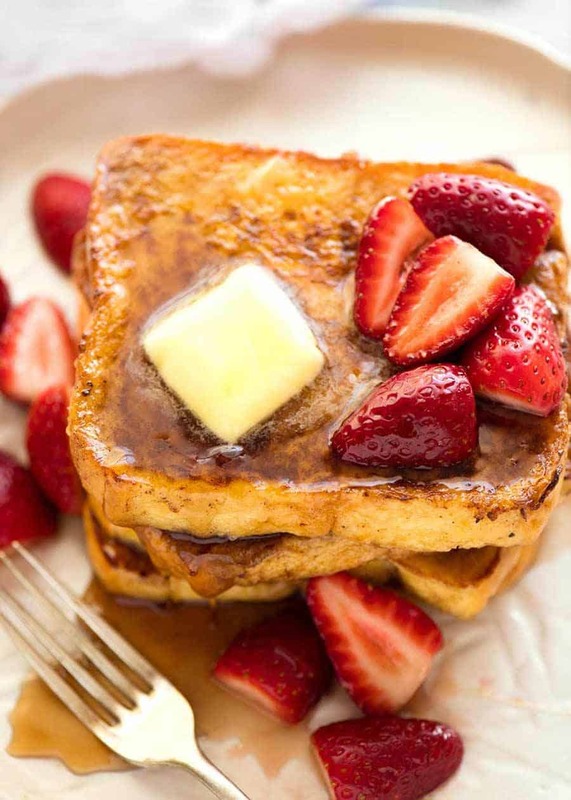 Serve with butter and plenty of maple syrup, and Macerated Strawberries if using! 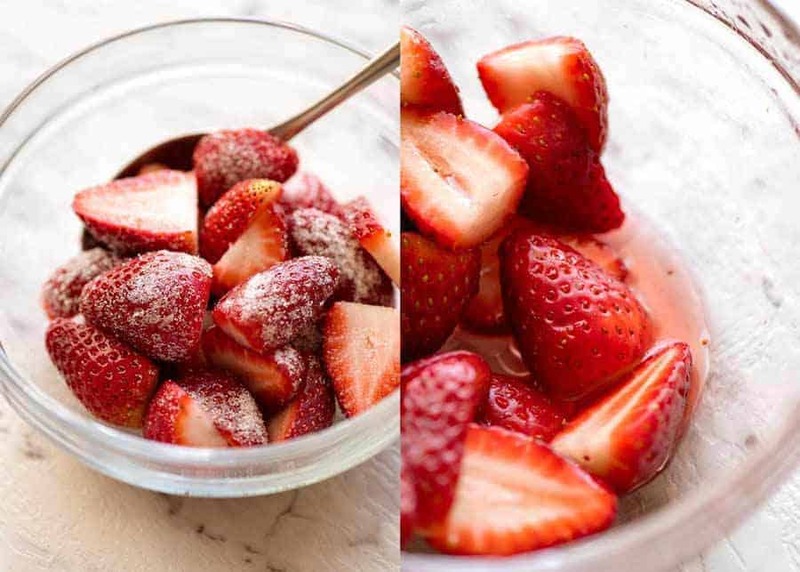 Toss strawberries with sugar, set aside for 20 minutes+. The strawberries will soften and sweat, and create a bit of syrup. 1. Best bread for French Toast: brioche is hands down the most indulgent (typically used by trendy bistros, pictured in post), also Challah (jewish bread) is excellent. After this good ole’ sandwich bread (preferably thick cut), followed by crusty artisan breads (sourdough etc), then everything and anything else (sliced bread rolls, french stick, baguettes, even things like Hot Cross Buns and other sweet rolls). 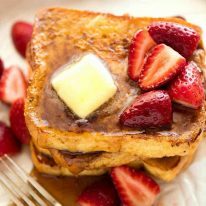 Slightly stale bread is better as fresh bread tends to soak up the mixture too quickly, causing the French Toast to be soggy inside. If your bread is super fresh, pop it in the oven at 180C/350F for 3 minutes on each side, just to dry it out slightly without colouring. Do not do this step if using crusty sourdough (doesn’t need it). - Cinnamon and vanilla is recommended, but still absolutely delish without. - I personally don’t recommend using cream in place of milk. I know it might seem like it will make it richer, but I feel like it leaves a greasy feel in the mouth. - The right egg to milk ratio is quite important – I think 2 eggs to ½ cup of milk is perfect. - I don’t use sugar in the egg mixture because a) there’s plenty of sweet poured on top later; and b) it makes the bread prone to burning. 3. Nutrition is for plain white sandwich bread, excludes topping. Originally published June 2018. Updated for housekeeping matters, no change to recipe. I love French toast so much. My dad makes the best French toast! 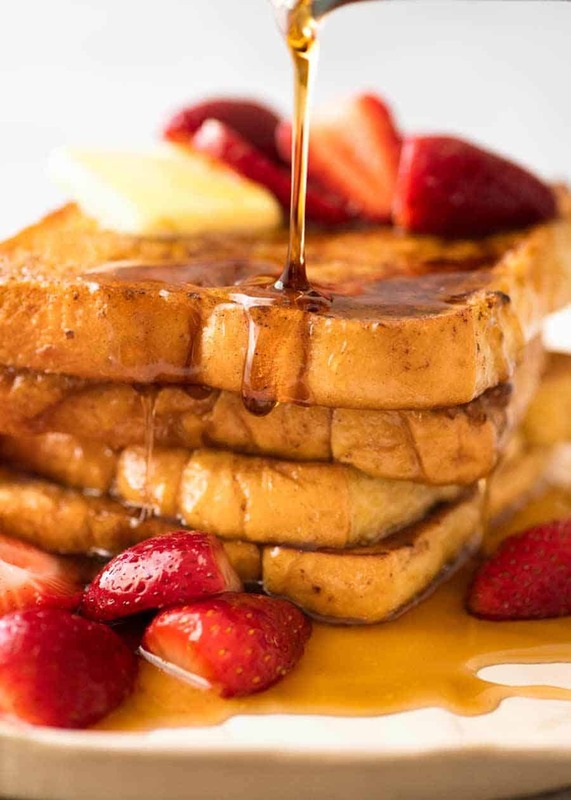 So glad I stumbled onto your site when looking for French toast. So yummy and true to predictions. First site I will visit in future when looking for recipes. Consider adding a dash of Cointreau to the macerated berries.